The Mayor of Buea, Patrick Ekema Esunge, on Sunday, January 27, in an attempt to seize taxis and park them on Buea Council premises in order to release them on Monday and break ghost town, rather caused the shutdown of Buea as taxis deserted the streets. The Mayor, in collaboration with the Southwest regional administration, on Sunday in the evening hours, again swooped in on drivers, confiscating identification and car documents and forcing them to drive and park their vehicles on the Council premises where they are expected to return on Monday, January 28, to collect their cabs and work on the traditional ghost town day. In areas like the Mile 17 Motor Park, taxis were impounded and their drivers ordered to drive alongside armed security officers and park at the Council premises. The action of the Mayor and security officials enraged the drivers who then decided to stop work and stop the other few taxis that were working, to ground their cabs, so that all drivers could unite as one and take a decisive action to end the target on their trade. One of the drivers, narrated that his own car was already impounded by the Council and police officers. “Did we start ghost town? Why has the focus turned only to drivers? Are we Government? Are we the ones to solve this problem?” he quipped. He asserted that those in authority should rather own up and handle the situation, rather than look for drivers to harass. Tension heightened as many people, young and elderly, were left stranded and trekking along the roads in their hundreds on Sunday January 27 evening. 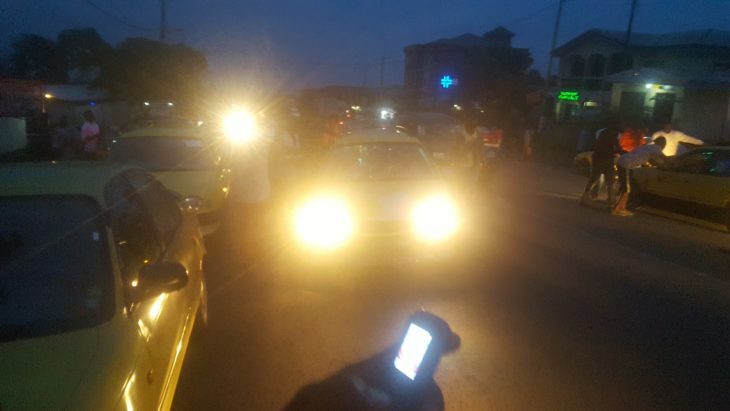 The drivers, some of whom had parked their vehicles beside the Great Soppo Market, and then formed a human road block for all taxis, intimated that they may, in the coming days, start a strike action against their victimisation by Mayor Ekema and Governor Okalia. One of the drivers expressed regret, stating that it could be easier for them to take an industrial action and stand by it as a union, but that the possibility for such a strong union has been dashed because the authorities strategically created three drivers’ unions in Buea, to be able to divide and rule them. Thanks for all of your hard work on this website. My mom really loves carrying out internet research and it’s really simple to grasp why. Many of us learn all regarding the dynamic medium you render both interesting and useful steps via your web blog and as well foster contribution from other individuals on this subject matter so our favorite girl is in fact being taught a whole lot. Take pleasure in the remaining portion of the new year. You are performing a dazzling job. I simply desired to thank you so much once again. I am not sure the things that I would have tried without the type of creative concepts contributed by you directly on such area. It previously was a real horrifying setting in my view, nevertheless encountering a skilled approach you managed that took me to leap over fulfillment. I’m thankful for the advice as well as pray you realize what a great job your are accomplishing training many people using your webblog. Most probably you haven’t encountered any of us. I wish to show thanks to you for rescuing me from such a condition. As a result of checking through the the web and obtaining thoughts which were not powerful, I was thinking my entire life was over. Being alive minus the solutions to the problems you have resolved as a result of this website is a crucial case, and the kind that would have in a wrong way affected my entire career if I hadn’t come across your web site. Your actual natural talent and kindness in taking care of all things was excellent. I don’t know what I would have done if I had not encountered such a point like this. I am able to at this moment relish my future. Thank you very much for this high quality and effective guide. I won’t be reluctant to suggest the blog to any person who wants and needs support on this issue. I must express appreciation to the writer just for rescuing me from this setting. Because of looking through the world wide web and seeing proposals which were not productive, I thought my life was done. Existing devoid of the approaches to the problems you have resolved all through your good report is a crucial case, and ones that might have badly affected my career if I had not discovered the blog. Your own personal skills and kindness in taking care of the whole thing was invaluable. I’m not sure what I would have done if I hadn’t encountered such a step like this. I can at this point relish my future. Thanks very much for this high quality and result oriented guide. I won’t be reluctant to propose your web sites to anybody who would like care on this area. I’m just commenting to let you be aware of of the helpful discovery my friend’s princess enjoyed reading your site. She even learned such a lot of details, including what it’s like to possess an incredible teaching mood to let men and women just gain knowledge of certain complicated issues. You undoubtedly surpassed people’s desires. Many thanks for delivering such effective, healthy, informative and in addition unique tips about that topic to Julie. I have to voice my gratitude for your kindness giving support to folks that require guidance on that issue. Your real dedication to getting the solution up and down had been especially helpful and have usually permitted employees much like me to attain their objectives. Your amazing invaluable suggestions entails much a person like me and especially to my office workers. Thank you; from all of us. I wish to express my appreciation to you for bailing me out of such a incident. After surfing through the search engines and coming across ideas which were not helpful, I believed my life was done. Being alive devoid of the answers to the difficulties you’ve resolved by way of your short post is a crucial case, and the ones which may have in a negative way affected my career if I had not discovered your blog. That talents and kindness in playing with all areas was vital. I am not sure what I would have done if I hadn’t encountered such a thing like this. It’s possible to at this moment look forward to my future. Thanks a lot very much for this skilled and sensible guide. I will not think twice to endorse your web site to anyone who desires recommendations on this problem. I together with my buddies have been checking the good secrets on the blog and then quickly came up with a horrible feeling I had not thanked the web site owner for those techniques. These women came so joyful to see them and have actually been having fun with these things. I appreciate you for actually being really kind and then for utilizing some ideal areas most people are really needing to understand about. My sincere apologies for not expressing gratitude to sooner. I precisely had to thank you so much yet again. I am not sure the things that I could possibly have carried out without these thoughts revealed by you directly on this industry. It was a troublesome circumstance in my position, but taking a look at a specialised way you solved it made me to cry with gladness. Now i’m thankful for the guidance and hope you realize what an amazing job you are getting into instructing many others all through your website. I know that you have never encountered any of us. My spouse and i got really comfortable when Chris managed to complete his studies from the precious recommendations he had from your own site. It is now and again perplexing just to be handing out key points some people could have been selling. We grasp we now have you to thank for this. The entire illustrations you have made, the simple blog navigation, the friendships your site help to instill – it’s all extraordinary, and it’s really making our son in addition to our family understand the idea is awesome, and that’s exceptionally serious. Many thanks for the whole thing! Thank you a lot for giving everyone an extremely special opportunity to read articles and blog posts from this blog. It really is so lovely and also full of fun for me personally and my office fellow workers to visit your blog at least three times in a week to study the fresh issues you will have. Of course, I’m so always contented considering the sensational tricks you serve. Certain two facts in this posting are essentially the most suitable I’ve had. Thanks so much for giving everyone an exceptionally wonderful chance to read critical reviews from this blog. It is often very useful and also jam-packed with a good time for me personally and my office co-workers to search your blog at minimum thrice in 7 days to read through the latest guidance you have got. And indeed, I’m just usually fulfilled with all the wonderful concepts you serve. Some 4 tips in this post are unequivocally the most beneficial we’ve ever had. I have to show some thanks to this writer for bailing me out of this type of situation. Because of browsing through the the net and getting ways which were not powerful, I figured my entire life was over. Being alive without the presence of solutions to the issues you’ve sorted out by way of this article content is a critical case, and those that could have adversely affected my career if I had not noticed the website. Your knowledge and kindness in touching all things was important. I am not sure what I would have done if I hadn’t encountered such a point like this. It’s possible to at this time look ahead to my future. Thanks a lot so much for the high quality and amazing guide. I won’t hesitate to recommend the website to anybody who wants and needs guidelines about this problem. I as well as my guys ended up reviewing the best advice located on your site while all of the sudden got a horrible suspicion I never expressed respect to the web blog owner for them. All of the people are actually so thrilled to learn all of them and now have without a doubt been making the most of these things. Many thanks for being really considerate and then for figuring out these kinds of impressive tips most people are really eager to be aware of. My personal sincere regret for not expressing gratitude to you earlier. I definitely wanted to compose a message so as to express gratitude to you for these magnificent solutions you are posting here. My particularly long internet look up has at the end been recognized with reputable suggestions to write about with my best friends. I would repeat that many of us site visitors are unquestionably lucky to live in a wonderful place with so many brilliant individuals with great pointers. I feel extremely fortunate to have discovered your weblog and look forward to tons of more fabulous minutes reading here. Thank you once again for a lot of things. Thank you a lot for providing individuals with remarkably brilliant opportunity to read critical reviews from this website. It can be so awesome and as well , full of fun for me and my office fellow workers to search your site no less than 3 times weekly to study the fresh stuff you have got. Of course, I am just always pleased considering the tremendous tactics you give. Selected two ideas in this post are definitely the simplest we have ever had. I in addition to my friends appeared to be viewing the excellent information and facts from the website then instantly I got a horrible suspicion I had not expressed respect to the web blog owner for those tips. My young boys are already so joyful to see all of them and have now very much been using those things. We appreciate you turning out to be well considerate and for pick out this kind of high-quality areas millions of individuals are really wanting to know about. Our sincere apologies for not expressing appreciation to you earlier. I together with my pals came examining the great items found on your site then before long got an awful feeling I never thanked the web site owner for those secrets. All of the guys are actually certainly glad to study them and have now in reality been taking advantage of these things. I appreciate you for really being well helpful as well as for deciding on this sort of useful themes millions of individuals are really eager to know about. My honest apologies for not expressing gratitude to you sooner. Thanks for your own effort on this web page. Kim takes pleasure in setting aside time for investigations and it is easy to see why. We notice all relating to the compelling means you offer invaluable guides via this blog and as well as inspire contribution from other ones on this theme so our own child is without question becoming educated a great deal. Enjoy the remaining portion of the new year. You are performing a great job. I simply wanted to thank you so much yet again. I am not sure the things that I could possibly have handled without the smart ideas documented by you directly on that question. It has been a very hard issue in my opinion, nevertheless discovering this professional fashion you solved that took me to jump with contentment. I’m just thankful for the service and even sincerely hope you recognize what an amazing job you are always undertaking instructing the others through your websites. I know that you’ve never got to know all of us. I simply wished to say thanks yet again. I’m not certain what I would have sorted out without the type of advice provided by you on this topic. It was a real fearsome setting in my opinion, however , observing a well-written avenue you managed that took me to leap for happiness. I’m happy for the help and in addition hope that you know what a great job that you are getting into educating other individuals through your web page. Most likely you haven’t come across all of us. I simply want to say I’m beginner to blogging and site-building and actually enjoyed this blog. Almost certainly I’m planning to bookmark your website . You amazingly come with fabulous articles and reviews. Thank you for revealing your webpage. My husband and i felt fortunate that Michael managed to finish off his analysis using the precious recommendations he discovered using your web page. It is now and again perplexing to simply choose to be offering tricks which usually a number of people may have been making money from. We remember we have got the website owner to appreciate for this. The type of explanations you made, the easy web site menu, the relationships you make it possible to create – it is many exceptional, and it is assisting our son in addition to our family consider that the theme is thrilling, and that is particularly essential. Thank you for all! I precisely had to thank you very much again. I am not sure the things I would have followed without the entire ideas shown by you over such theme. It was a very troublesome situation in my view, however , encountering this well-written avenue you treated that took me to weep with happiness. I’m just happy for your guidance and as well , hope that you find out what a great job you happen to be accomplishing teaching people today using your web blog. More than likely you have never got to know any of us. I happen to be writing to let you be aware of of the remarkable discovery my friend’s girl went through reading your webblog. She came to understand a good number of things, which include what it’s like to have a marvelous coaching spirit to make the rest smoothly comprehend certain problematic things. You undoubtedly exceeded my desires. Many thanks for providing such practical, healthy, revealing and in addition unique guidance on the topic to Ethel. Needed to create you that little bit of remark so as to thank you so much again for these stunning opinions you have shared on this website. This is simply generous of people like you to convey without restraint just what a number of us could have offered for sale as an e book to end up making some profit for themselves, most notably seeing that you could have tried it in the event you decided. The creative ideas as well worked to become fantastic way to fully grasp the rest have similar dream really like my very own to know the truth whole lot more when considering this problem. I’m certain there are millions of more pleasant instances up front for individuals that discover your blog post. I’m still learning from you, but I’m improving myself. I absolutely enjoy reading all that is written on your site.Keep the information coming. I liked it! I will right away clutch your rss as I can’t to find your e-mail subscription hyperlink or newsletter service. Do you’ve any? Please let me know so that I may just subscribe. Thanks. whoah this weblog is wonderful i like studying your posts. Keep up the great work! You know, a lot of individuals are hunting around for this information, you can aid them greatly. Thank you for some other magnificent article. Where else may just anybody get that kind of info in such an ideal means of writing? I’ve a presentation next week, and I’m at the search for such info. I simply wanted to post a simple remark in order to thank you for these precious advice you are showing at this website. My extensive internet research has at the end of the day been paid with pleasant facts to write about with my pals. I ‘d declare that many of us website visitors actually are extremely lucky to live in a very good community with so many marvellous people with useful guidelines. I feel truly lucky to have encountered the web site and look forward to really more excellent times reading here. Thank you again for a lot of things. Whats Taking place i am new to this, I stumbled upon this I have found It absolutely useful and it has helped me out loads. I am hoping to give a contribution & assist different customers like its aided me. Good job. I have read a few good stuff here. Certainly price bookmarking for revisiting. I surprise how so much effort you set to create this kind of fantastic informative site. Whats Taking place i’m new to this, I stumbled upon this I’ve discovered It absolutely useful and it has helped me out loads. I’m hoping to contribute & aid different users like its helped me. Great job. Thanks for sharing superb informations. Your website is very cool. I am impressed by the details that you¡¦ve on this site. It reveals how nicely you perceive this subject. Bookmarked this web page, will come back for more articles. You, my pal, ROCK! I found simply the information I already searched everywhere and simply couldn’t come across. What a perfect web-site. hey there and thank you for your information – I’ve certainly picked up anything new from right here. I did however expertise a few technical issues using this site, since I experienced to reload the web site a lot of times previous to I could get it to load properly. I had been wondering if your hosting is OK? Not that I am complaining, but slow loading instances times will sometimes affect your placement in google and can damage your high quality score if ads and marketing with Adwords. Well I’m adding this RSS to my email and could look out for a lot more of your respective exciting content. Ensure that you update this again soon..
Hello, Neat post. There is an issue with your site in internet explorer, might test this¡K IE nonetheless is the marketplace chief and a large component of other people will miss your excellent writing due to this problem. I and also my guys were viewing the best thoughts from your site and instantly I got a terrible feeling I had not expressed respect to the web site owner for those tips. My women ended up so passionate to see all of them and have now very much been loving them. I appreciate you for getting indeed helpful as well as for considering this sort of tremendous themes most people are really wanting to know about. My honest regret for not expressing gratitude to you sooner. hello!,I really like your writing very so much! percentage we communicate extra about your article on AOL? I require an expert in this house to solve my problem. Maybe that is you! Having a look forward to look you. Hi there, I found your blog by means of Google while looking for a similar matter, your website came up, it seems to be good. I have bookmarked it in my google bookmarks. I intended to put you the little bit of note to be able to say thanks once again for the extraordinary tricks you have provided at this time. It is simply incredibly open-handed of you in giving easily what exactly many of us would’ve marketed for an ebook to help with making some dough on their own, and in particular considering the fact that you could possibly have tried it in the event you wanted. These good tips in addition acted like the fantastic way to be certain that most people have similar desire just like my own to understand a good deal more when considering this issue. I’m certain there are some more fun sessions in the future for individuals that read carefully your blog post. I simply want to say I’m all new to blogging and site-building and honestly liked your page. Likely I’m want to bookmark your website . You actually come with excellent articles. Thanks a lot for revealing your website page. I¡¦ll immediately grasp your rss feed as I can not to find your e-mail subscription hyperlink or e-newsletter service. Do you’ve any? Kindly permit me recognize so that I could subscribe. Thanks. I have been browsing on-line greater than 3 hours lately, but I by no means found any interesting article like yours. It is pretty worth sufficient for me. Personally, if all site owners and bloggers made good content as you probably did, the net will likely be a lot more useful than ever before. whoah this blog is great i really like studying your articles. Keep up the good paintings! You recognize, many persons are searching round for this information, you can help them greatly. Wow, amazing weblog structure! How lengthy have you ever been running a blog for? you made running a blog glance easy. The whole look of your web site is great, let alone the content! certainly like your web-site but you have to check the spelling on several of your posts. A number of them are rife with spelling problems and I to find it very troublesome to tell the reality then again I¡¦ll surely come back again. obviously like your website but you need to test the spelling on several of your posts. A number of them are rife with spelling issues and I to find it very bothersome to tell the truth nevertheless I will definitely come back again. I and also my buddies ended up examining the good hints found on your website then unexpectedly got a terrible suspicion I never thanked the web blog owner for those tips. Those young boys became so excited to learn them and have in effect in fact been having fun with them. Appreciation for getting quite accommodating and also for pick out this form of incredibly good useful guides millions of individuals are really wanting to discover. My very own sincere apologies for not expressing appreciation to you sooner. Great amazing things here. I¡¦m very glad to look your post. Thank you so much and i’m having a look ahead to contact you. Will you please drop me a e-mail? Valuable info. Lucky me I found your site by accident, and I’m shocked why this twist of fate didn’t took place in advance! I bookmarked it. Simply desire to say your article is as astounding. The clarity in your post is just nice and i can assume you are an expert on this subject. Fine with your permission allow me to grab your RSS feed to keep up to date with forthcoming post. Thanks a million and please keep up the enjoyable work. Thanks for some other informative site. Where else may I am getting that type of information written in such a perfect method? I have a challenge that I’m just now running on, and I have been on the glance out for such info. Thank you for every other excellent post. The place else may just anybody get that kind of info in such an ideal way of writing? I’ve a presentation subsequent week, and I’m on the look for such info. Great goods from you, man. I have understand your stuff previous to and you’re just extremely fantastic. I actually like what you’ve acquired here, really like what you are saying and the way in which you say it. You make it enjoyable and you still care for to keep it sensible. I can not wait to read far more from you. This is actually a tremendous web site. I would like to thnkx for the efforts you have put in writing this site. I’m hoping the same high-grade blog post from you in the upcoming also. Actually your creative writing abilities has encouraged me to get my own blog now. Really the blogging is spreading its wings quickly. Your write up is a great example of it. Hi there. I discovered your blog by means of Google whilst searching for a related topic, your site got here up. It looks great. I have bookmarked it in my google bookmarks to come back then. Hey there. I found your site by the use of Google whilst looking for a related matter, your website got here up. It looks good. I have bookmarked it in my google bookmarks to visit then. Hey there. I discovered your website by the use of Google while looking for a comparable subject, your website got here up. It appears to be good. I’ve bookmarked it in my google bookmarks to come back then. Hello there. I found your website via Google even as looking for a similar subject, your site came up. It seems to be great. I have bookmarked it in my google bookmarks to visit then. Hi there. I discovered your blog by the use of Google at the same time as searching for a similar topic, your site got here up. It appears great. I have bookmarked it in my google bookmarks to visit then. I simply needed to say thanks again. I am not sure the things that I might have sorted out in the absence of the type of tactics revealed by you over this concern. Previously it was the traumatic problem for me personally, however , taking note of the very expert mode you solved that forced me to leap for delight. Now i am grateful for your work as well as hope that you find out what an amazing job that you’re getting into training many others all through your websites. More than likely you’ve never come across all of us. Generally I don’t learn post on blogs, but I wish to say that this write-up very pressured me to check out and do it! Your writing taste has been amazed me. Thank you, very great article. Hiya, I’m really glad I’ve found this information. Today bloggers publish just about gossip and web stuff and this is actually irritating. A good blog with exciting content, this is what I need. Thank you for making this site, and I’ll be visiting again. Do you do newsletters by email? Hi there. I discovered your web site by means of Google while looking for a related topic, your website came up. It appears to be great. I have bookmarked it in my google bookmarks to visit then. Hey there. I found your blog via Google whilst searching for a similar matter, your website got here up. It appears to be good. I’ve bookmarked it in my google bookmarks to visit then. Hiya, I am really glad I’ve found this info. Nowadays bloggers publish just about gossip and web stuff and this is actually frustrating. A good web site with exciting content, that is what I need. Thanks for making this web site, and I will be visiting again. Do you do newsletters by email? Hiya, I am really glad I’ve found this info. Today bloggers publish only about gossip and net stuff and this is actually irritating. A good site with interesting content, that’s what I need. Thanks for making this web site, and I will be visiting again. Do you do newsletters by email? Hi there, I discovered your blog by means of Google at the same time as looking for a related subject, your site got here up, it appears good. I’ve bookmarked it in my google bookmarks. Thanks for any other informative website. Where else may I am getting that kind of information written in such a perfect means? I’ve a undertaking that I am just now working on, and I’ve been on the glance out for such information. Hello there. I found your site by means of Google even as looking for a comparable topic, your website got here up. It appears good. I have bookmarked it in my google bookmarks to come back then. Hi there. I found your site via Google whilst searching for a similar topic, your web site came up. It appears to be great. I’ve bookmarked it in my google bookmarks to come back then. Hi there. I discovered your website by way of Google at the same time as looking for a related topic, your web site came up. It appears to be great. I’ve bookmarked it in my google bookmarks to come back then. Thanks , I have recently been looking for information approximately this topic for a while and yours is the greatest I have came upon till now. But, what concerning the bottom line? Are you sure concerning the supply? Nice post. I was checking constantly this blog and I’m impressed! Extremely useful information specifically the last part 🙂 I care for such info much. I was seeking this particular information for a long time. Thank you and good luck. Hi there. I discovered your website via Google while searching for a comparable subject, your site came up. It seems great. I have bookmarked it in my google bookmarks to visit then. Hiya, I’m really glad I have found this information. Today bloggers publish only about gossip and net stuff and this is really irritating. A good web site with interesting content, that’s what I need. Thanks for making this website, and I will be visiting again. Do you do newsletters by email? Hello.This post was really remarkable, particularly since I was looking for thoughts on this issue last Monday. Hiya, I am really glad I have found this information. Nowadays bloggers publish just about gossip and web stuff and this is actually annoying. A good website with exciting content, that’s what I need. Thank you for making this site, and I will be visiting again. Do you do newsletters by email? Hey there. I discovered your web site by the use of Google at the same time as searching for a related topic, your website got here up. It appears to be great. I’ve bookmarked it in my google bookmarks to visit then. Hiya, I am really glad I’ve found this information. Today bloggers publish just about gossip and internet stuff and this is really frustrating. A good site with interesting content, that’s what I need. Thanks for making this site, and I’ll be visiting again. Do you do newsletters by email? Hiya, I’m really glad I have found this information. Nowadays bloggers publish just about gossip and internet stuff and this is really irritating. A good web site with exciting content, this is what I need. Thanks for making this web site, and I will be visiting again. Do you do newsletters by email? I have been examinating out some of your articles and i can state pretty nice stuff. I will surely bookmark your site. You really make it seem so easy along with your presentation however I to find this matter to be really something that I feel I might never understand. It kind of feels too complicated and extremely huge for me. I’m having a look ahead in your next put up, I¡¦ll attempt to get the dangle of it! Hey there. I discovered your website via Google even as looking for a comparable subject, your site came up. It appears to be great. I have bookmarked it in my google bookmarks to come back then. Hi there. I found your website by way of Google whilst searching for a comparable subject, your site came up. It appears to be good. I’ve bookmarked it in my google bookmarks to come back then. Hi there. I discovered your site via Google even as looking for a related topic, your website got here up. It seems to be great. I have bookmarked it in my google bookmarks to visit then. Hiya, I am really glad I have found this information. Nowadays bloggers publish just about gossip and net stuff and this is actually irritating. A good blog with exciting content, that’s what I need. Thanks for making this web site, and I will be visiting again. Do you do newsletters by email? Hi there. I discovered your web site by means of Google whilst looking for a related matter, your website came up. It appears good. I’ve bookmarked it in my google bookmarks to visit then. Hiya, I’m really glad I have found this info. Today bloggers publish only about gossip and web stuff and this is really frustrating. A good blog with exciting content, that is what I need. Thanks for making this website, and I will be visiting again. Do you do newsletters by email? Helpful information. Lucky me I found your web site unintentionally, and I am surprised why this accident did not came about earlier! I bookmarked it. naturally like your web-site but you need to check the spelling on several of your posts. Several of them are rife with spelling problems and I to find it very bothersome to tell the truth on the other hand I¡¦ll surely come back again. Hello there. I found your site by means of Google even as looking for a similar topic, your web site came up. It seems great. I have bookmarked it in my google bookmarks to visit then. Hiya, I am really glad I have found this info. Today bloggers publish only about gossip and net stuff and this is actually annoying. A good website with interesting content, this is what I need. Thank you for making this website, and I will be visiting again. Do you do newsletters by email? Hi there. I discovered your website via Google at the same time as searching for a related matter, your site came up. It appears great. I’ve bookmarked it in my google bookmarks to come back then. Hiya, I am really glad I have found this information. Nowadays bloggers publish only about gossip and net stuff and this is really irritating. A good web site with interesting content, that’s what I need. Thanks for making this web-site, and I’ll be visiting again. Do you do newsletters by email? Hi there. I found your web site by way of Google even as searching for a related subject, your website got here up. It appears good. I have bookmarked it in my google bookmarks to come back then. Hey there. I found your website by way of Google even as searching for a similar topic, your website got here up. It seems good. I’ve bookmarked it in my google bookmarks to visit then. Hiya, I am really glad I’ve found this information. Nowadays bloggers publish just about gossip and internet stuff and this is really frustrating. A good web site with exciting content, this is what I need. Thank you for making this web site, and I’ll be visiting again. Do you do newsletters by email? Hi there. I discovered your blog by the use of Google at the same time as searching for a similar subject, your website came up. It looks great. I have bookmarked it in my google bookmarks to come back then. Hiya, I am really glad I have found this info. Today bloggers publish just about gossip and web stuff and this is actually annoying. A good website with exciting content, this is what I need. Thank you for making this site, and I will be visiting again. Do you do newsletters by email? I needed to compose you this very little observation to thank you so much yet again for all the unique tricks you have featured in this article. It has been quite wonderfully generous of you giving openly what many people would’ve marketed as an ebook in making some dough on their own, precisely seeing that you might well have tried it if you decided. These pointers as well worked as the fantastic way to know that some people have a similar passion just as my personal own to know the truth more in regard to this condition. I know there are several more fun periods ahead for individuals that looked at your blog. Hello there. I discovered your website by the use of Google whilst looking for a similar subject, your site came up. It seems to be good. I have bookmarked it in my google bookmarks to visit then. Hiya, I’m really glad I have found this information. Nowadays bloggers publish only about gossip and net stuff and this is really irritating. A good site with exciting content, this is what I need. Thank you for making this site, and I will be visiting again. Do you do newsletters by email? I really wanted to send a comment in order to thank you for these splendid tips and hints you are giving at this website. My rather long internet lookup has now been honored with good strategies to talk about with my good friends. I ‘d point out that we visitors actually are rather lucky to be in a fantastic website with many marvellous individuals with valuable tips. I feel really fortunate to have discovered your site and look forward to tons of more fabulous minutes reading here. Thanks a lot again for everything. Hiya, I am really glad I’ve found this information. Today bloggers publish only about gossip and net stuff and this is really annoying. A good blog with interesting content, this is what I need. Thanks for making this web-site, and I’ll be visiting again. Do you do newsletters by email? Hey there. I discovered your site via Google whilst searching for a similar subject, your site got here up. It seems good. I’ve bookmarked it in my google bookmarks to visit then. Hello there. I found your web site by means of Google while looking for a comparable subject, your site got here up. It seems good. I have bookmarked it in my google bookmarks to come back then. Hiya, I am really glad I have found this info. Today bloggers publish just about gossip and internet stuff and this is actually annoying. A good web site with interesting content, this is what I need. Thank you for making this site, and I will be visiting again. Do you do newsletters by email? Hiya, I am really glad I have found this info. Today bloggers publish only about gossip and net stuff and this is actually frustrating. A good blog with interesting content, this is what I need. Thanks for making this web site, and I will be visiting again. Do you do newsletters by email? Hi there. I discovered your web site by way of Google while looking for a similar subject, your site got here up. It seems good. I have bookmarked it in my google bookmarks to come back then. Hi there. I found your blog by means of Google even as searching for a related topic, your website came up. It looks great. I’ve bookmarked it in my google bookmarks to visit then. My spouse and i got excited John could carry out his studies out of the precious recommendations he received in your weblog. It is now and again perplexing to just find yourself giving for free tricks which often some others could have been trying to sell. And we all grasp we now have the writer to give thanks to for this. The main explanations you have made, the simple site navigation, the friendships you can assist to create – it’s many fantastic, and it is facilitating our son in addition to the family reason why that article is fun, and that is quite fundamental. Many thanks for all! Hiya, I am really glad I’ve found this info. Today bloggers publish only about gossip and net stuff and this is really frustrating. A good site with exciting content, this is what I need. Thanks for making this web-site, and I will be visiting again. Do you do newsletters by email? Hiya, I’m really glad I have found this information. Today bloggers publish just about gossip and net stuff and this is actually annoying. A good blog with interesting content, that’s what I need. Thanks for making this website, and I will be visiting again. Do you do newsletters by email? hi!,I really like your writing so a lot! percentage we communicate more about your post on AOL? I require an expert in this space to solve my problem. Maybe that is you! Taking a look forward to see you. Hiya, I am really glad I’ve found this info. Nowadays bloggers publish only about gossip and net stuff and this is really frustrating. A good blog with interesting content, this is what I need. Thanks for making this web-site, and I will be visiting again. Do you do newsletters by email? Hi there. I found your web site by the use of Google while looking for a related matter, your website came up. It seems to be good. I have bookmarked it in my google bookmarks to come back then. Hiya, I’m really glad I’ve found this info. Today bloggers publish just about gossip and net stuff and this is really annoying. A good site with interesting content, that’s what I need. Thank you for making this web-site, and I will be visiting again. Do you do newsletters by email? Hey there. I found your web site by means of Google while searching for a comparable topic, your site got here up. It seems great. I’ve bookmarked it in my google bookmarks to visit then. Hiya, I’m really glad I have found this info. Nowadays bloggers publish just about gossip and web stuff and this is actually annoying. A good blog with interesting content, this is what I need. Thank you for making this site, and I will be visiting again. Do you do newsletters by email? Hi there. I found your web site via Google even as looking for a similar topic, your site came up. It appears to be great. I’ve bookmarked it in my google bookmarks to visit then. Hi there. I found your website by the use of Google while searching for a similar topic, your web site came up. It seems great. I’ve bookmarked it in my google bookmarks to come back then. Hey there. I discovered your site via Google whilst looking for a related matter, your web site got here up. It appears great. I’ve bookmarked it in my google bookmarks to visit then. You actually make it appear so easy together with your presentation but I to find this topic to be really one thing that I believe I might never understand. It kind of feels too complicated and very extensive for me. I am looking forward for your subsequent submit, I will attempt to get the dangle of it! Somebody essentially assist to make significantly posts I would state. That is the first time I frequented your website page and so far? I surprised with the research you made to create this particular put up incredible. Great job! you are actually a good webmaster. The website loading velocity is amazing. It sort of feels that you are doing any distinctive trick. Also, The contents are masterwork. you’ve done a fantastic job on this subject! Great post. I was checking continuously this blog and I’m impressed! Extremely helpful information specifically the last part 🙂 I care for such info much. I was looking for this particular info for a very long time. Thank you and best of luck. Hey there. I found your website by the use of Google whilst searching for a related topic, your website came up. It appears great. I’ve bookmarked it in my google bookmarks to visit then. Hey there. I discovered your web site via Google at the same time as looking for a similar matter, your website got here up. It appears good. I have bookmarked it in my google bookmarks to come back then. Hi there. I found your site by way of Google even as searching for a related matter, your web site got here up. It appears good. I have bookmarked it in my google bookmarks to come back then. I¡¦m no longer certain where you’re getting your information, however good topic. I must spend some time finding out much more or working out more. Thanks for excellent info I was searching for this info for my mission. Hiya, I’m really glad I’ve found this information. Nowadays bloggers publish only about gossip and internet stuff and this is really frustrating. A good website with exciting content, that is what I need. Thanks for making this site, and I will be visiting again. Do you do newsletters by email? I’ve been browsing online more than 3 hours lately, but I never found any attention-grabbing article like yours. It¡¦s beautiful price enough for me. Personally, if all site owners and bloggers made just right content as you probably did, the web will be a lot more helpful than ever before. Thank you for sharing superb informations. Your web site is so cool. I’m impressed by the details that you¡¦ve on this site. It reveals how nicely you perceive this subject. Bookmarked this web page, will come back for more articles. You, my pal, ROCK! I found simply the info I already searched all over the place and simply could not come across. What an ideal site. It¡¦s actually a great and useful piece of information. I am glad that you shared this useful info with us. Please keep us informed like this. Thank you for sharing. I must show my thanks to the writer for bailing me out of this incident. As a result of surfing around through the the web and coming across opinions which were not productive, I thought my entire life was well over. Existing without the strategies to the problems you’ve sorted out by means of the post is a crucial case, and those which might have in a wrong way affected my entire career if I hadn’t encountered the blog. Your own personal training and kindness in handling every part was important. I don’t know what I would’ve done if I hadn’t come upon such a stuff like this. I can now relish my future. Thank you very much for this expert and results-oriented help. I won’t be reluctant to propose your site to any individual who requires recommendations about this issue. Hello there. I discovered your site via Google even as looking for a related topic, your website came up. It seems great. I’ve bookmarked it in my google bookmarks to come back then. Hello there. I found your web site via Google while looking for a comparable topic, your web site came up. It looks great. I’ve bookmarked it in my google bookmarks to visit then. Hello there. I found your site by means of Google while searching for a related matter, your web site came up. It seems great. I have bookmarked it in my google bookmarks to come back then. Hello there. I found your website by the use of Google whilst looking for a comparable topic, your web site got here up. It looks great. I’ve bookmarked it in my google bookmarks to visit then. Hiya, I am really glad I have found this information. Nowadays bloggers publish just about gossip and net stuff and this is actually frustrating. A good site with exciting content, this is what I need. Thanks for making this web-site, and I’ll be visiting again. Do you do newsletters by email? Hey there. I found your blog by the use of Google even as looking for a similar matter, your website came up. It looks great. I’ve bookmarked it in my google bookmarks to visit then. Hey there. I found your web site by way of Google while looking for a similar topic, your web site came up. It appears great. I have bookmarked it in my google bookmarks to visit then. Hiya, I am really glad I have found this information. Today bloggers publish only about gossip and web stuff and this is really annoying. A good web site with exciting content, this is what I need. Thank you for making this website, and I’ll be visiting again. Do you do newsletters by email? Valuable information. Lucky me I discovered your website by chance, and I’m stunned why this accident did not took place in advance! I bookmarked it. Whats Happening i am new to this, I stumbled upon this I’ve discovered It positively helpful and it has aided me out loads. I’m hoping to give a contribution & assist other customers like its aided me. Great job. I simply want to say I am just all new to blogs and certainly loved your blog. Likely I’m want to bookmark your website . You actually have tremendous well written articles. Thank you for sharing with us your web-site. Hiya, I am really glad I’ve found this info. Nowadays bloggers publish only about gossip and internet stuff and this is actually irritating. A good website with exciting content, that’s what I need. Thanks for making this web site, and I will be visiting again. Do you do newsletters by email? Hey there. I found your web site by the use of Google while looking for a similar matter, your web site came up. It looks good. I have bookmarked it in my google bookmarks to come back then. Hi there. I found your blog by the use of Google at the same time as searching for a similar matter, your web site got here up. It appears to be good. I’ve bookmarked it in my google bookmarks to visit then. Hello there. I found your web site by means of Google while searching for a related subject, your web site came up. It appears great. I’ve bookmarked it in my google bookmarks to visit then. Hello there. I discovered your web site via Google while searching for a comparable topic, your website got here up. It seems good. I’ve bookmarked it in my google bookmarks to visit then. Hiya, I am really glad I have found this info. Today bloggers publish just about gossip and net stuff and this is actually frustrating. A good web site with interesting content, that is what I need. Thanks for making this web-site, and I’ll be visiting again. Do you do newsletters by email? Hiya, I am really glad I’ve found this information. Nowadays bloggers publish only about gossip and web stuff and this is actually frustrating. A good site with exciting content, that is what I need. Thanks for making this web-site, and I’ll be visiting again. Do you do newsletters by email? Good day very cool website!! Guy .. Excellent .. Superb .. I’ll bookmark your site and take the feeds additionally¡KI am satisfied to seek out a lot of helpful info here within the submit, we’d like develop more techniques in this regard, thank you for sharing. . . . . . Needed to put you the little bit of observation to be able to say thank you again for all the fantastic strategies you’ve shared on this site. This is quite strangely generous with you to give publicly precisely what most of us would’ve marketed for an e-book to earn some dough on their own, principally given that you could have tried it in case you decided. The basics likewise acted like the good way to comprehend the rest have a similar eagerness really like mine to understand great deal more regarding this condition. Certainly there are numerous more pleasurable times up front for many who start reading your blog. You actually make it seem so easy with your presentation however I in finding this matter to be really something that I believe I might by no means understand. It seems too complicated and very extensive for me. I am having a look forward in your next submit, I¡¦ll try to get the cling of it! Someone necessarily help to make critically articles I might state. That is the first time I frequented your website page and up to now? I surprised with the analysis you made to make this actual publish incredible. Magnificent process! Thanks , I have just been looking for info approximately this subject for a long time and yours is the greatest I have found out till now. But, what in regards to the conclusion? Are you sure about the supply? Hey there. I found your blog by way of Google whilst looking for a similar matter, your web site got here up. It seems to be good. I’ve bookmarked it in my google bookmarks to come back then. hello!,I love your writing so so much! proportion we communicate extra about your article on AOL? I require a specialist on this area to resolve my problem. Maybe that is you! Taking a look ahead to look you. Hiya, I’m really glad I’ve found this info. Nowadays bloggers publish only about gossip and net stuff and this is really frustrating. A good website with exciting content, that is what I need. Thanks for making this web-site, and I’ll be visiting again. Do you do newsletters by email? Thank you for any other informative website. The place else may I am getting that kind of info written in such an ideal manner? I’ve a mission that I’m simply now working on, and I have been at the look out for such information. Hiya, I’m really glad I have found this info. Today bloggers publish just about gossip and web stuff and this is really frustrating. A good website with interesting content, this is what I need. Thanks for making this web-site, and I’ll be visiting again. Do you do newsletters by email? Hiya, I am really glad I’ve found this information. Today bloggers publish just about gossip and net stuff and this is really annoying. A good site with interesting content, that’s what I need. Thanks for making this web-site, and I will be visiting again. Do you do newsletters by email? Hiya, I’m really glad I’ve found this information. Today bloggers publish just about gossip and net stuff and this is really frustrating. A good web site with interesting content, that’s what I need. Thank you for making this website, and I’ll be visiting again. Do you do newsletters by email? Hey there. I found your site by way of Google whilst searching for a similar topic, your site got here up. It looks great. I’ve bookmarked it in my google bookmarks to visit then. Hello there. I discovered your blog by means of Google even as looking for a comparable matter, your website got here up. It seems to be great. I have bookmarked it in my google bookmarks to visit then. I must show my appreciation to the writer for rescuing me from this type of dilemma. Right after scouting throughout the the net and seeing ways which are not helpful, I thought my life was done. Living devoid of the approaches to the issues you have resolved all through this posting is a critical case, and the kind that could have negatively affected my career if I hadn’t discovered the website. Your good know-how and kindness in controlling all areas was important. I don’t know what I would have done if I had not discovered such a stuff like this. I’m able to at this moment look forward to my future. Thank you very much for the expert and amazing guide. I will not think twice to suggest the sites to anyone who would like support on this issue. Hiya, I am really glad I have found this info. Nowadays bloggers publish just about gossip and net stuff and this is really irritating. A good website with exciting content, that is what I need. Thanks for making this web site, and I will be visiting again. Do you do newsletters by email? Hiya, I’m really glad I’ve found this info. Today bloggers publish just about gossip and internet stuff and this is really irritating. A good blog with exciting content, this is what I need. Thanks for making this web-site, and I will be visiting again. Do you do newsletters by email? Hi there. I discovered your website via Google while searching for a similar topic, your site came up. It appears great. I’ve bookmarked it in my google bookmarks to come back then. Hi there. I discovered your site by means of Google whilst searching for a comparable topic, your web site came up. It seems great. I have bookmarked it in my google bookmarks to visit then. Hi there. I discovered your web site by the use of Google while searching for a comparable topic, your website got here up. It appears good. I have bookmarked it in my google bookmarks to visit then. Hi there. I found your website via Google while searching for a comparable topic, your web site got here up. It appears to be great. I have bookmarked it in my google bookmarks to visit then. Hiya, I’m really glad I’ve found this info. Today bloggers publish only about gossip and web stuff and this is really frustrating. A good site with interesting content, that’s what I need. Thank you for making this web site, and I will be visiting again. Do you do newsletters by email? Hi there. I discovered your web site via Google even as looking for a related subject, your website came up. It seems great. I have bookmarked it in my google bookmarks to visit then. Hi there. I found your site by the use of Google even as looking for a similar matter, your website came up. It appears good. I have bookmarked it in my google bookmarks to come back then. Hey there. I discovered your web site by way of Google while searching for a related subject, your web site came up. It appears great. I’ve bookmarked it in my google bookmarks to visit then. Hi there. I found your blog by means of Google at the same time as searching for a similar matter, your web site got here up. It appears to be good. I’ve bookmarked it in my google bookmarks to come back then. Hello there. I discovered your blog by way of Google at the same time as searching for a related subject, your web site got here up. It looks great. I’ve bookmarked it in my google bookmarks to visit then. Hiya, I’m really glad I have found this information. Nowadays bloggers publish only about gossip and internet stuff and this is really irritating. A good site with interesting content, that’s what I need. Thanks for making this web site, and I will be visiting again. Do you do newsletters by email? Hiya, I am really glad I have found this info. Today bloggers publish just about gossip and web stuff and this is actually irritating. A good blog with exciting content, that is what I need. Thank you for making this website, and I’ll be visiting again. Do you do newsletters by email? I would like to thank you for the efforts you have put in writing this web site. I am hoping the same high-grade blog post from you in the upcoming also. In fact your creative writing skills has inspired me to get my own web site now. Actually the blogging is spreading its wings rapidly. Your write up is a good example of it. Great tremendous issues here. I¡¦m very satisfied to peer your article. Thank you a lot and i’m looking ahead to touch you. Will you kindly drop me a mail? Hi there. I found your website by means of Google while searching for a comparable topic, your website got here up. It appears good. I’ve bookmarked it in my google bookmarks to come back then. Hello there. I found your site by the use of Google while looking for a comparable topic, your web site came up. It seems great. I have bookmarked it in my google bookmarks to come back then. Hey there. I found your website by means of Google while looking for a similar matter, your site got here up. It seems good. I have bookmarked it in my google bookmarks to visit then. Hi there. I found your web site by the use of Google at the same time as searching for a related matter, your site got here up. It appears to be good. I’ve bookmarked it in my google bookmarks to visit then. Hi there. I found your site by means of Google even as searching for a related topic, your web site got here up. It looks good. I’ve bookmarked it in my google bookmarks to come back then. Hiya, I am really glad I’ve found this information. Today bloggers publish only about gossip and web stuff and this is actually irritating. A good web site with interesting content, that is what I need. Thanks for making this website, and I will be visiting again. Do you do newsletters by email? Hiya, I am really glad I’ve found this info. Nowadays bloggers publish just about gossip and web stuff and this is actually annoying. A good website with exciting content, this is what I need. Thanks for making this website, and I will be visiting again. Do you do newsletters by email? Hiya, I am really glad I have found this info. Nowadays bloggers publish only about gossip and internet stuff and this is actually frustrating. A good blog with exciting content, this is what I need. Thanks for making this web-site, and I will be visiting again. Do you do newsletters by email? Hiya, I am really glad I have found this info. Today bloggers publish just about gossip and net stuff and this is really irritating. A good web site with interesting content, that is what I need. Thanks for making this site, and I’ll be visiting again. Do you do newsletters by email? Hi there. I found your site by way of Google at the same time as looking for a related matter, your site came up. It appears good. I’ve bookmarked it in my google bookmarks to come back then. Hey there. I discovered your site by way of Google whilst searching for a similar subject, your web site came up. It looks good. I’ve bookmarked it in my google bookmarks to visit then. Hey there. I discovered your web site via Google even as looking for a similar matter, your web site got here up. It appears to be great. I’ve bookmarked it in my google bookmarks to come back then. Hiya, I am really glad I’ve found this information. Today bloggers publish just about gossip and internet stuff and this is actually frustrating. A good website with interesting content, that is what I need. Thanks for making this web-site, and I will be visiting again. Do you do newsletters by email? Hiya, I’m really glad I have found this information. Today bloggers publish just about gossip and web stuff and this is really irritating. A good web site with exciting content, that’s what I need. Thank you for making this website, and I’ll be visiting again. Do you do newsletters by email? Hiya, I’m really glad I have found this info. Nowadays bloggers publish just about gossip and web stuff and this is actually frustrating. A good site with interesting content, that’s what I need. Thanks for making this website, and I’ll be visiting again. Do you do newsletters by email? Hiya, I’m really glad I’ve found this information. Nowadays bloggers publish just about gossip and web stuff and this is actually frustrating. A good site with interesting content, that’s what I need. Thanks for making this site, and I will be visiting again. Do you do newsletters by email? Spot on with this write-up, I honestly feel this site needs a great deal more attention. I’ll probably be back again to read more, thanks for the information! Hello there. I discovered your website via Google even as looking for a comparable matter, your site got here up. It seems to be great. I have bookmarked it in my google bookmarks to come back then. Hiya, I am really glad I’ve found this information. Nowadays bloggers publish just about gossip and net stuff and this is really frustrating. A good site with exciting content, that is what I need. Thanks for making this website, and I’ll be visiting again. Do you do newsletters by email? Hi there. I found your site by means of Google whilst looking for a related subject, your site came up. It appears good. I have bookmarked it in my google bookmarks to visit then. Hi there. I discovered your website by the use of Google at the same time as looking for a related subject, your web site came up. It looks good. I have bookmarked it in my google bookmarks to come back then. Hey there. I discovered your website by means of Google at the same time as searching for a comparable matter, your website came up. It appears to be good. I have bookmarked it in my google bookmarks to visit then. Hi there. I discovered your blog via Google even as looking for a comparable matter, your website came up. It appears good. I’ve bookmarked it in my google bookmarks to visit then. Hello there. I discovered your site via Google while searching for a comparable topic, your site got here up. It appears great. I’ve bookmarked it in my google bookmarks to come back then. Hey there. I discovered your blog by means of Google at the same time as looking for a related matter, your website came up. It seems to be great. I have bookmarked it in my google bookmarks to come back then. Hey there. I found your site via Google at the same time as searching for a related matter, your website got here up. It appears to be good. I have bookmarked it in my google bookmarks to come back then. Hiya, I am really glad I’ve found this information. Today bloggers publish only about gossip and web stuff and this is really annoying. A good blog with interesting content, this is what I need. Thank you for making this web site, and I’ll be visiting again. Do you do newsletters by email? Hiya, I’m really glad I’ve found this information. Nowadays bloggers publish just about gossip and internet stuff and this is really irritating. A good web site with interesting content, that is what I need. Thank you for making this web site, and I will be visiting again. Do you do newsletters by email? I want to blog about issues I do not desire connecting with my ‘work’ self. Exactly how do I select a blog site host that has a great anonymity document, in other words, I do not desire it to be easy for people to match up my IP address or gain access to my personal information. Additionally, having set the blog up, how do you urge high quantity visitors?. I’ve only used LJ before and I want to try something a bit various, but privacy is the biggest problem for me. Would certainly invite suggestions of good free blog site hosts. Hi there. I discovered your web site by way of Google at the same time as looking for a similar subject, your site got here up. It seems good. I have bookmarked it in my google bookmarks to come back then. It appears there are websites and also blog sites committed to lots of tasks, such television, songs, lives of celebrities, and so on. Yet I actually can not discover web sites as well as blog sites dedicated to analysis, sadly a second thought when it concerns leisure activities … Any individual understand some actually popular as well as great ones? Classic and present literature are both great with me, since I read both … Thanks so much! =o-RRB-. Hi there. I discovered your website by the use of Google while looking for a related topic, your web site came up. It appears good. I’ve bookmarked it in my google bookmarks to come back then. Hi there. I found your site by way of Google even as looking for a related topic, your site got here up. It seems to be good. I’ve bookmarked it in my google bookmarks to visit then. Hello there. I discovered your blog by way of Google whilst looking for a comparable matter, your website got here up. It seems to be great. I’ve bookmarked it in my google bookmarks to visit then. Hey there. I discovered your blog by the use of Google at the same time as searching for a similar matter, your site came up. It appears great. I have bookmarked it in my google bookmarks to visit then. This website is really a walk-through you discover the details it suited you in regards to this and didn’t know who must. Glimpse here, and you’ll absolutely discover it. Hi there. I found your web site by the use of Google whilst looking for a related subject, your web site got here up. It appears great. I have bookmarked it in my google bookmarks to visit then. Hey there. I found your web site by way of Google even as looking for a related matter, your web site got here up. It seems to be great. I have bookmarked it in my google bookmarks to visit then. Hiya, I am really glad I’ve found this info. Nowadays bloggers publish just about gossip and internet stuff and this is really irritating. A good website with interesting content, that’s what I need. Thanks for making this web site, and I’ll be visiting again. Do you do newsletters by email? Hiya, I am really glad I’ve found this information. Nowadays bloggers publish only about gossip and web stuff and this is really irritating. A good site with exciting content, this is what I need. Thanks for making this website, and I’ll be visiting again. Do you do newsletters by email? Hey there. I discovered your website by means of Google at the same time as searching for a related matter, your website came up. It seems great. I have bookmarked it in my google bookmarks to come back then. Hi there. I found your web site by the use of Google at the same time as looking for a related matter, your website got here up. It appears great. I’ve bookmarked it in my google bookmarks to come back then. Hi there. I found your web site by the use of Google whilst searching for a comparable matter, your web site got here up. It seems good. I’ve bookmarked it in my google bookmarks to come back then. Thanks for every other magnificent article. Where else could anyone get that kind of info in such an ideal method of writing? I have a presentation next week, and I am on the search for such info. you are truly a just right webmaster. The web site loading speed is amazing. It seems that you are doing any distinctive trick. Moreover, The contents are masterwork. you’ve done a wonderful task on this topic! Hey there. I found your web site by way of Google at the same time as looking for a similar subject, your site got here up. It looks great. I’ve bookmarked it in my google bookmarks to visit then.